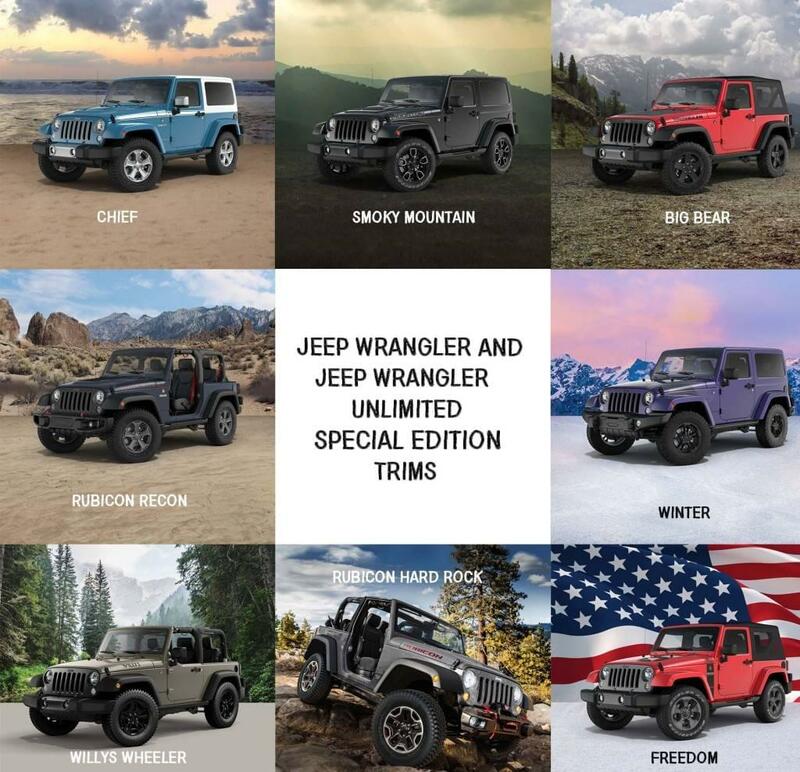 While on the subject of Jeeps new special editions for the Jeep Wrangler and Wrangler Unlimited, we decided to check off all the special editions thus far. There are about 16 in all (excluding the 75th Anniversary Edition), really only 8 since each special edition is shared between the two models. Regardless, once Jeep has a new edition addition, you can bet they go by fast. Check out these limited editions, before they disappear. Built to honor what Jeep is all about, the Rubicon Recon is the most capable Jeep made to date. Designed with a power dome vented hood, off-road rock rails with tread plates, a winch-capable bumper, and a military-inspired front axle it’s geared up to handle the toughest terrain. For a little style, it has a premium soft top, black Rubicon decals on the hood, a Rubicon Recon badge, and it rides on 17-inch wheels with off-road tires. The 4:1 Rock-Trac part-time 4WD system has also been installed. Inside is a consumer favorite, heated front seats and leather seats throughout. Slush mats with a red logo are built in for any mess you may track in after a day of mudding, and no one will mistake the Jeep for another due to its limited edition Rubicon Recon dash plaque. When it comes to off-road mayhem, heavy-duty cast differential covers protect the powertrain, and a Jeep Trail Rated Kit is available. Starting MSRP is $39,145 for the 2017 Jeep Wrangler Rubicon Recon, and $42,945 for 2017 Jeep Wrangler Unlimited Rubicon Recon. Hey there, Chief! Does anyone like that title? At first glance, this is not the kind of Jeep you’d call “Chief,” especially in its standard baby blue body paint with a white hard top. If Malibu Barbie rode in a Jeep, this is it. Don’t let it fool you though, it’s made for off-road glory, with skid plates protecting the undercarriage, and integrated with the Command-Trac 4×4 system. If you want a tougher look, there are darker colors available for the paint job. The exterior also comes with silver accents in the grille, a white high-gloss beltline decal, and rides on 17-inch high-gloss silver wheels. The Jeep Chief also has heated leather seating for supreme interior comfort, and a 9-speaker Alpine Premium sound system. Starting MSRP is $34,445 for the 2017 Jeep Wrangler Chief, and $38,245 for the 2017 Jeep Wrangler Unlimited Chief. The Jeep Wrangler/Wrangler Unlimited Smoky Mountain edition has some flair. The exterior is souped up with high-gloss black accents, side steps, and a body color hardtop, all riding on 18-inch polished high-gloss black wheels. A smoky mountain decal on the side of its power bulge hood completes the exterior ensemble. When the roof and doors are removed, a topographical map pops up as a sports bar cover for the exposed frame. Inside, the center console looks pretty sweet with green lighting in all that black, and the seats are leather trimmed and the front seats are heated. Also comes with the Command Trac 4×4 system. Starting MSRP for the 2017 Jeep Wrangler Smoky Mountain is $34,345, and $38,145 for the 2017 Jeep Wrangler Unlimited Smoky Mountain. The mighty bear, an animal not to contend with unless you have a death wish. Can’t say the same for the Jeep Wrangler/ Wrangler Unlimited Big Bear trim though – this is the kind of bear you bring on an off-road adventure. Designed with a special decal on the hood, the Big Bear has a topographical map of the John Bull Trail in the Big Bear Mountains, said to be a legendary off-road route due to its difficulty. To tackle this, the Big Bear trim has been outfitted with rock rails, all-terrain KO2 tires, and Jeep’s Command Trac 4×4 system. For a little style and comfort, it has a removable soft top, Sedoso seating, and an 8-speaker sound system for listening to some tunes. Starting MSRP is $28,695 for the 2017 Jeep Wrangler Big Bear, and $32,595 for the 2017 Jeep Wrangler Unlimited Big Bear. Inspired by winter athletes, the Jeep Wrangler and Wrangler Unlimited Winter is designed to keep old bones warm so drivers can always stay in control in the cockpit. This of course means heated, leather-trimmed seats. The exterior is beefed up to handle harsh conditions, the Winter trims have KO2 tires, off-road steel bumpers, premium off-road rock rails, and it rides on 17-inch mid-gloss black wheels. Black is actually its contrasting color combination, with black grille accents, a black fuel filler door, and black taillamp guards. Keeping up with the dark theme, there are piano black accents in the cockpit and black leather seat trimming. All-weather slush mats are there to protect the interior from any snow or mud tracked into the cabin, and the sound system is a nine-speaker premium Alpine audio system. Built for tackling harsh conditions in the air and on the road, the standard Trac-Lok limited slip differential is there to keep the Jeep under control in unexpected off-road conditions, and the Command-Trac 4×4 system has been integrated. Starting MSRP for the 2017 Jeep Wrangler Winter is $36,445, and it is $40,245 for the 2017 Jeep Wrangler Unlimited Winter. Really want to help Jeep honor the men and women protecting our freedom, or just feeling a little patriotic? For every Jeep Wrangler or Wrangler Unlimited Freedom edition purchased, a portion of the sale will be donated to the USO to help support our nation’s heroes on the way home. To set the trim apart from the rest, the Freedom trim has mid-gloss granite crystal accents on the grille, Freedom edition badging on the sides, and a Freedom edition decal on the hood. Style choices for the exterior are a premium soft-top and 18-inch mid-gloss granite crystal wheels. The interior comes with McKinley leather-trimmed seats. For the off-road venture, premium off-road rock rails have been installed, as well as cast differential covers. The Command-Trac 4×4 system has been integrated to handle off-road conditions. Starting MSRP for the 2017 Jeep Wrangler Freedom Edition $29,695, and it is $33,595 for the 2017 Jeep Wrangler Unlimited Freedom. For a combination of off-roading capability and classic style, the Willys Wheeler Jeep trim is the way to go. Inspired by the original Willys CJ, it comes with all the right components for tackling rough rock crawls while looking good. The exterior has some style with high-gloss black details on the grille, a black Willys decal is on the hood, and a “Four-Wheel-Drive” decal is on the back. Off-road rock rails have been installed, and the Command-Trac 4×4 system comes with a Trac-Lok rear differential to keep all four tires in check. Have a little more privacy with deep-tinted windows, keep the floor clean with all-weather slush mats, and enjoy some fresh air with the removable soft top. Available are also half metal doors to keep this Jeep a vehicle made for the outdoors, and mud-terrain tires are the standard for some real dirty adventure. A Jeep Trail-Rated Kit is also available. Starting MSRP for the 2017 Jeep Wrangler Willys Wheeler is $28,295, and it is $32,195 for the 2017 Jeep Wrangler Unlimited Willys Wheeler. Another Rubicon specialty, the Jeep Wrangler and Wrangler Unlimited Rubicon Hard Rock trim are made for rock-crawling. It’s time to conquer off-road trails everywhere, with a power dome hood, the Rock-Trac 4×4 system, and Tru-Loc mechanical lockers for steep climbs and tricky road conditions. The interior has heated, leather-trimmed front seats, a leather-wrapped steering wheel, and all-weather slush mats. For a little style, the bumpers are steel and winch-capable, a premium removable soft top has been installed, along with premium off-road rock rails. Skid plates have also been integrated into the undercarriage to protect powertrain components from off-road hazards. Starting MSRP for the 2017 Jeep Wrangler Rubicon Hard Rock is $38,445, and it is $42,245 for the 2017 Jeep Wrangler Unlimited Hard Rock. Looking for one of these Jeep Wrangler or Wrangler Unlimited trims? Check out our inventory online or give us a call today.